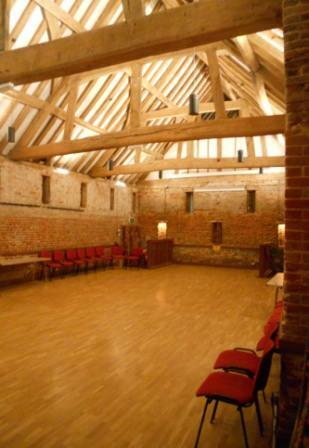 The Cross Barn at Odiham is our home for the Práctilonga on the first Friday of the month. We are delighted to have found this superb and fascinating venue. The Cross Barn dates back originally to 1532, and is the oldest agricultural brick built building in Hampshire. Beautifully restored, it now benefits from wonderful beams, beautiful lighting, a superb sound system, and, best of all, one of the nicest wooden dance floors around, with the added luxury of under-floor heating so it’s always warm and welcoming. In fact, the overall effect is anything but . . . agricultural! There are also kitchen facilities for our usual hot drinks and light refreshments. Situated in the heart of Odiham village, the hall is easily accessed from the M3, the A287 Farnham Road or the B3349 Alton Road from the south. Free parking (on Friday evenings after 6.00pm) in the adjacent car park and within easy walking distance of the Barn in the public car park off the High Street in Deer Park View (more parking information below). Parking is plentiful and close-by (less than a minute’s walk) but there are some useful things to know. - there are four spaces next to the hall right by the entrance. - there are about 30 spaces in the car park next door, again on the left and just before the brick walled area. We put up signs to show you where to park – and where not to. Please park considerately to make the best use of the spaces available. The Cross Barn is in a residential area – please arrive and leave quietly.